The curriculum is a blend of a fundamental preschool grouping that enables students to prepare for their future as knowledgeable, active members of the community. Our curriculum is a combination of a child centered approach and some use of The Creative Curriculum. In both, our staff find the best mixture to ensure all children in care develop in a manner that is best suited to the individual child. We are able to support the children with large group, small group and individual meetings so all needs are identified and met. Every effort is made to maintain a consistent daily schedule because young children thrive on routine as a measure of security. 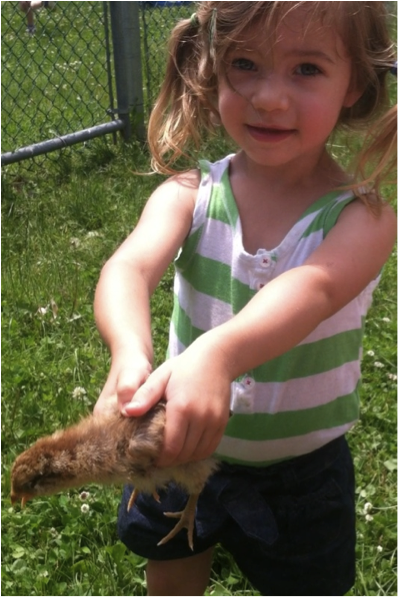 We have circle time, snack, outdoor play, lunch, art and free play at the same times each day. Occasionally a routine is altered for special visitors or occasions. At the beginning of each session, parents are provided with a written copy of the current daily schedule. There is also a copy posted in each classroom. Our playgrounds are designed to encourage different types of physical activity for the many different levels of development. We provide exciting gross motor activities, such as tunnels, obstacle courses, musical movement, parachute play and ride on vehicles in our large playgrounds. When outdoor play becomes impossible, we spend time dancing, having center-wide parades and obstacle courses. Teachers observe and evaluate each child’s physical development. A variety of activities help children develop their listening, speaking, pre-reading and pre-writing skills. Even if the child is of an age where “reading” or “writing” are not developmentally appropriate, there are many activities teachers encourage because they prepare young muscles, eyes and minds for the exciting moment when a child will be able to read and write. For example, coloring, painting gluing and play dough develop fine muscle control in fingers that may not yet be ready to hold a pencil correctly; classroom discussions on current themes, holidays and activities stimulate curiosity; show and tell encourages public speaking skills and respectful listening to others. Teachers write out words, stories and sentences, which lead to mimicking of “reading” behavior; letters are introduced both formally and informally. You will notice objects in the building are labeled in an effort to create a “print rich” environment, because research shows seeing print promotes reading readiness. Activities such as calendar, block play, patterns and sorting objects help children discover Math. Our teachers cover a broad range of topics including rote counting numeral identification, matching groups of objects and concepts or more, less, same and different. 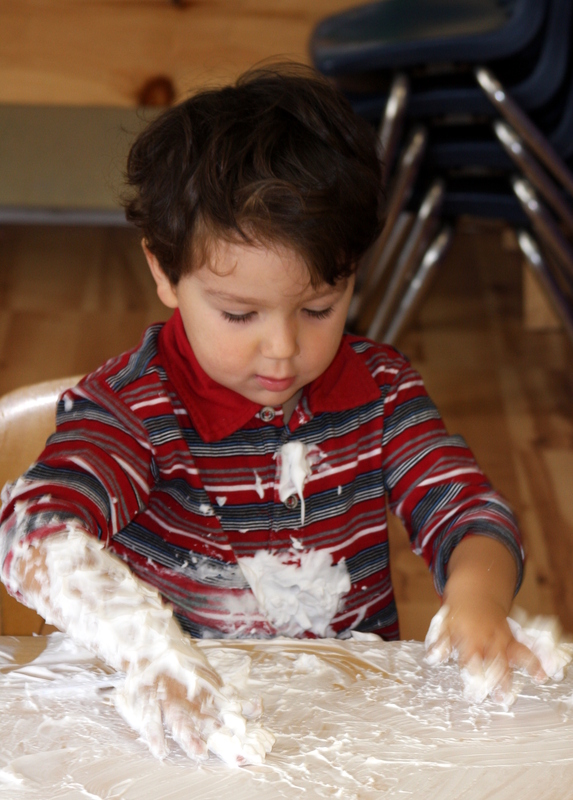 Comparing attributes of objects and their defining characteristics, filling and dumping water and sand are early activities in volume comparison, puzzles and expose children formally and informally to early math concepts. Simple hands-on activities are designed to encourage little ones to feel as if they are independent experimenters, as well as receiving a taste of some big topics that many young children find exciting. We have many themes and activities on nature. We explore simple machinery (ie. Brio tool shop, gears, pulleys, rollers, levels, etc.) magnifying glasses, balance scales, measuring tape, nature walks and live displays (caterpillars to butterflies, larvae to ladybugs or tad poles to frogs). Our extensive program in this area is used to extend ideas from other areas, as well as to encourage children to appreciate ideas, pictures and objects for their creative and aesthetic qualities. A variety of mediums are used… crayons, paints, markers, shaving cream, wood scrapes, cloth, string, buttons, paper, sand, clay, glue and many other natural objects. There are many posters/pictures of artwork displayed around the room for the students to observe, contemplate and discuss. Art projects are presented at both independent and guided levels of skill. Collages can promote such concepts as shape, color, volume or attributes of a set. Drawing a face is an introduction to writing letters; observing details in a picture is a guide to deciphering words in a sentence. For over 16 years, we have been most fortunate to have Fran Burstein, a very talented artist and art teacher, on our faculty. Read about music, gardening and more.